OK, back to business. Here are two gems, one I've had for many years, the other I've only just acquired. A yard sale find, as so many of my favorite items are. And because these are a matched pair – little did I know the LP I've had for so long had a counterpart – I've decided to put them up as a two-fer. 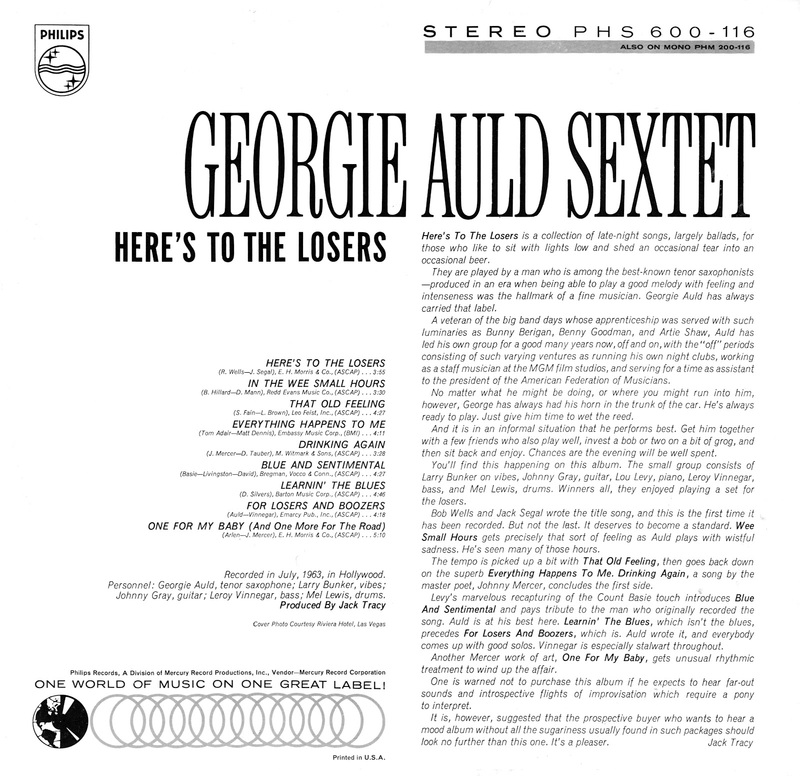 Tenor sax player Georgie Auld was something of a superstar in his day. 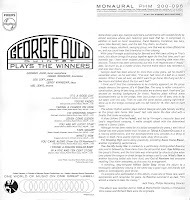 As the hot tenor man in the Artie Shaw and Benny Goodman orchestras, Auld could write his own ticket. And he could really blow. Born in Canada in 1919, he moved to the USA in his first decade and took up alto in his teen years. After hearing Coleman Hawkins, he switched to tenor and developed a big, boxy sound reminiscent of the Hawk's. With Goodman he became a real star, playing in various versions of the leader's sextet. If you've checked out Gems before, you know that down the list of posts there's an offering of airchecks by BG that feature Georgie. Highly recommended if you haven't sampled it already. 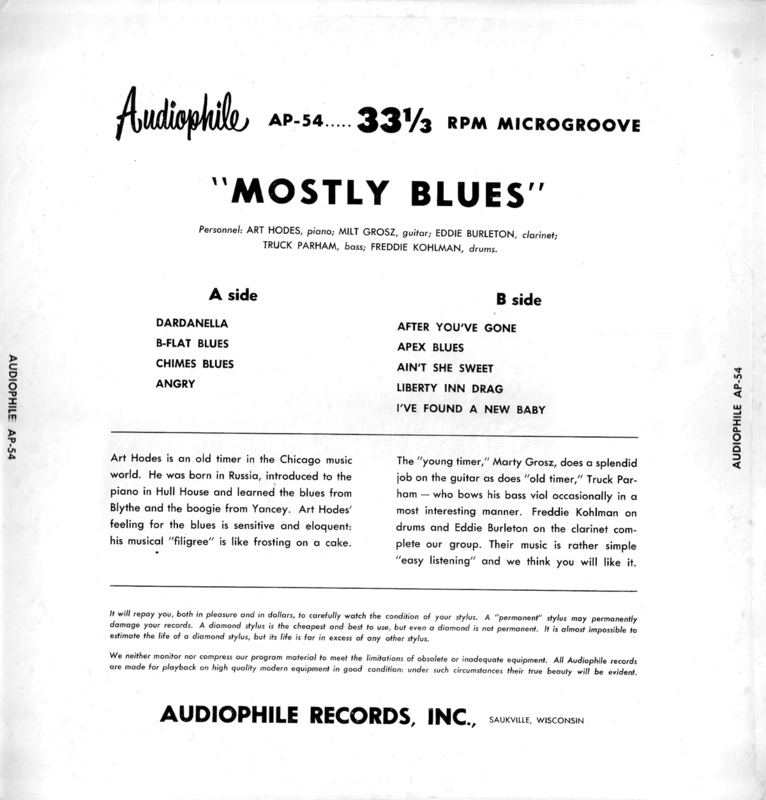 In the mid-'50s, Auld made money recording yackety-sax stuff on rock 'n' roll records. But by the early '60s, he was back on the jazz track. 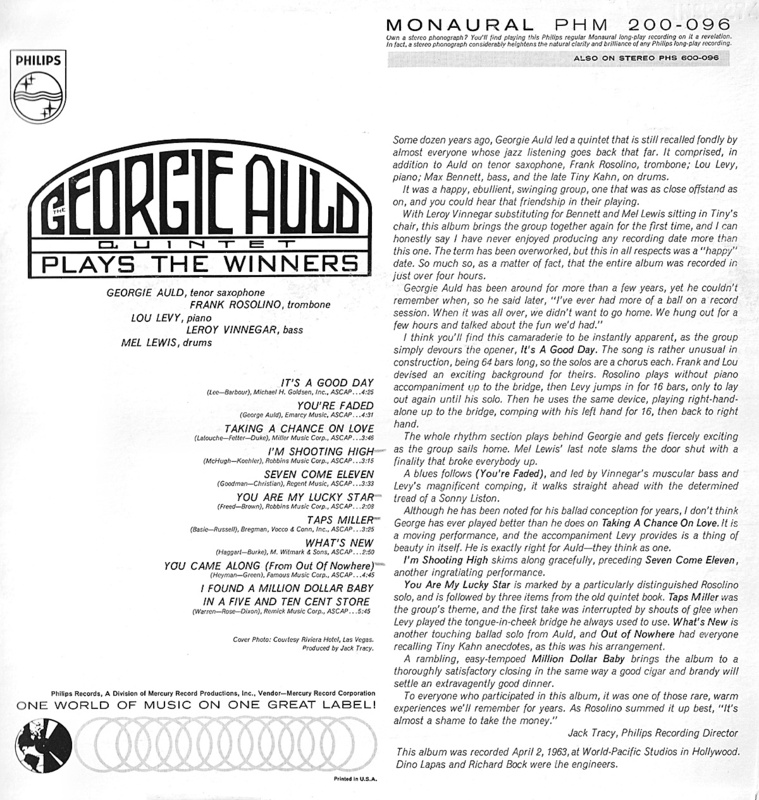 These two records both come from 1963 and are excellent examples of Auld's mature style in a small-group setting with fine younger players. 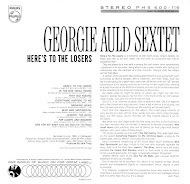 While Georgie Auld falls somewhere in between Coleman Hawkins and Dexter Gordon stylistically, to my mind he doesn't get much credit for having evolved with the music. 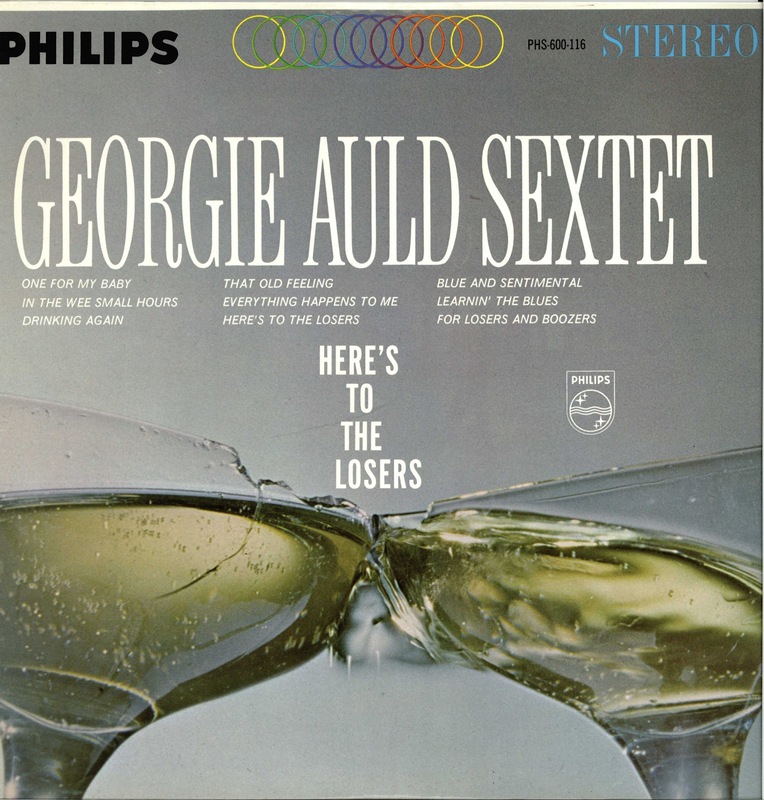 The guy who started out playing Bix's "Davenport Blues" with Bunny Berigan is the same guy who evokes Sonny Rollins here with "For Losers and Boozers." 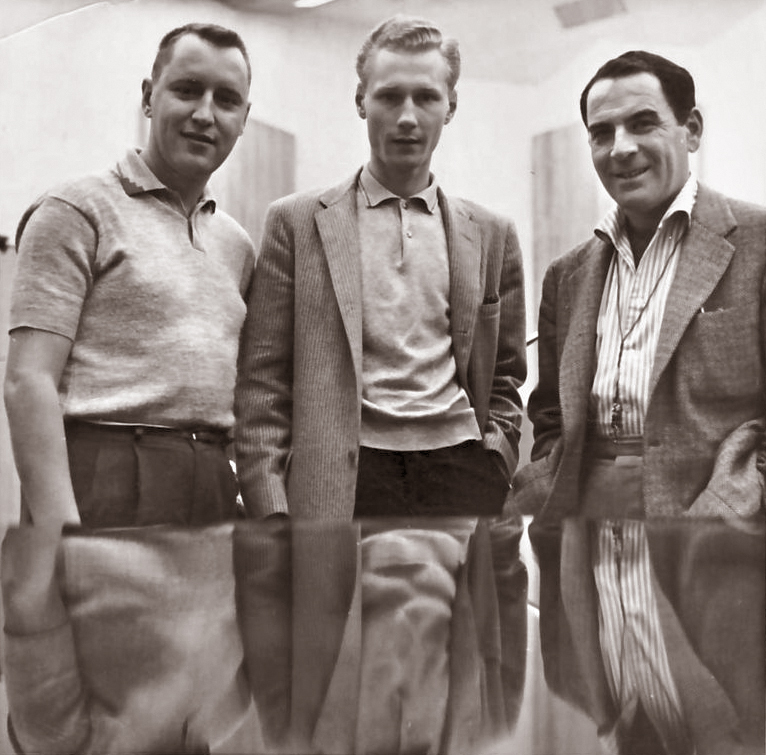 If you've never really heard him – or only heard him in a big band setting – these sides should be a revelation. 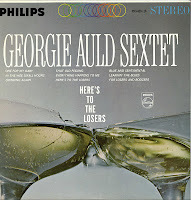 As always, the tunes were ripped from the original vinyl with only a very minor cleaning of occasional pops and clicks. 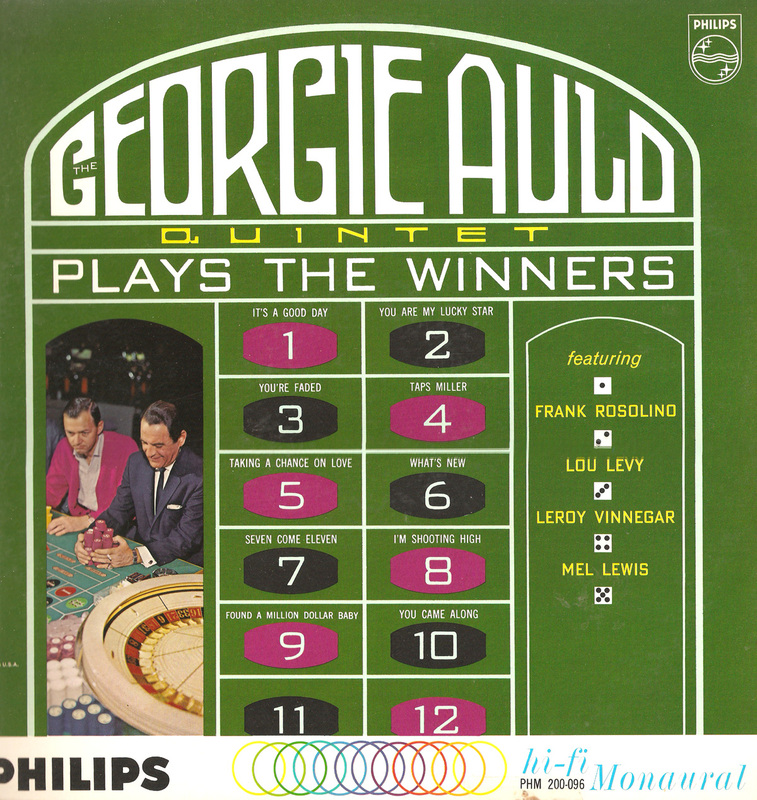 Auld, ts; Frank Rosolino, tbn; Lou Levy, p; Leroy Vinnegar, b; Mel Lewis, d.
Auld, ts; Frank Larry Bunker, vbs; Johnny Gray, g; Leroy Vinnegar, b; Mel Lewis, d.
Pursuant to the last post on Gems came a comment from the good Baron, a very helpful observer of our work here. He put me in touch with a site that specializes in all manner of hot jazz and offers disco- and biographical information of a highly detailed variety to one and all. One of their listings covers a Vocalion date for a Chicago group called Lloyd Smith and His Gut-Bucketeers from 1930. 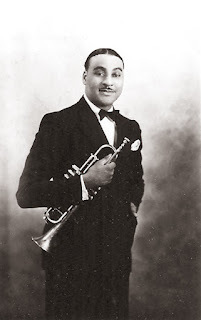 The trumpet player was originally thought to be Jabbo Smith, but it is now known the horn man was one Clarence "Count" Rich. My man from the Maxwell Street market! So, thanks to Baron, here are the Lloyd Smith tunes featuring the Count. His sound is certainly less aggressive and virtuosic than Jabbo's, but Rich seems to be looking stylistically beyond Poppa Louis. "I'm Going Away Just to Wear You Off My Mind" features an excellent solo by the Count, and the tenor and alto work (Faber Smith, on alto, later was part of Rich's band) is excellent for the period. The vocalizing is a bit hokey, but the scatting (a lot of it) is great. If Rich continued on in this vein, it's easy to see why he was a hit on the North Side in the mid-to-late '30s. 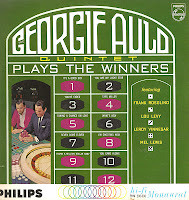 There are only five tunes here, but that's all they recorded. Later on Rich's band was billed as the "recording orchestra," so maybe someday we'll uncover material recorded under his leadership. Until then, enjoy! 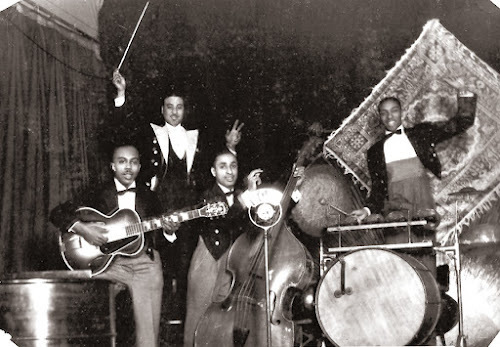 Clarence “Count” Rich, tp, v; Faber Smith, as; Warren Smith, ts; Lloyd Smith, p; Jimmy Smith, bjo; Earl Roach, d, v.
Here's one of the photos from the remnants of what must have been Count Rich's scrapbook. From left, Hurley Ramey, the Count, Raymond Nelson and Eugene "Scotty" Scott. I've been meaning to post this one for quite a while now. 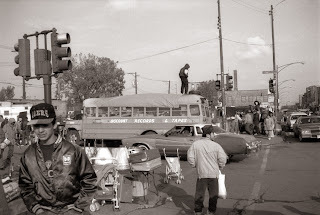 The great street bazaar and music extravaganza known as Maxwell Street is – sadly – long gone. You've probably heard of it in connection with Chicago blues, and maybe you remember seeing the neighborhood as a backdrop to Aretha Franklin's cameo in the Blues Brothers movie. There was music at Maxwell Street every Sunday, to be sure, but the Windy City's massive flea market was so much more than just a place for the South Side's greats and near-greats to blow for the people. It was perhaps the closest thing to a black market that America has ever had. I was lucky enough to live in Chicago during the market's final heyday. 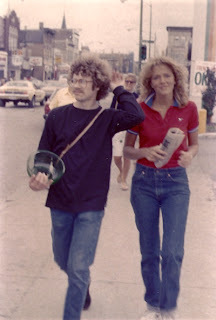 In the mid-'70s, I was there most weekends during the warm summer months. Most often I would go with a friend from grad school, an inveterate collector like myself, and we would look for old records for me, old cameras for him. I scored many a treasure perusing the endless blocks that comprised the market, including several Mingus 78s on Excelsior from 1946, an original version of "Pithecanthropus Erectus," a box of 10-inch Blue Notes, a full set of James Brown LPs on the King label and countless blues records in varying degrees of playability. I loved the place. left is my kid sister, in town for a visit. One morning (the market ran from about 5 a.m. to around 1 p.m.), I came across a woman selling what appeared to be a pile of old newspapers. She had them arranged on an old tablecloth spread out on the sidewalk. 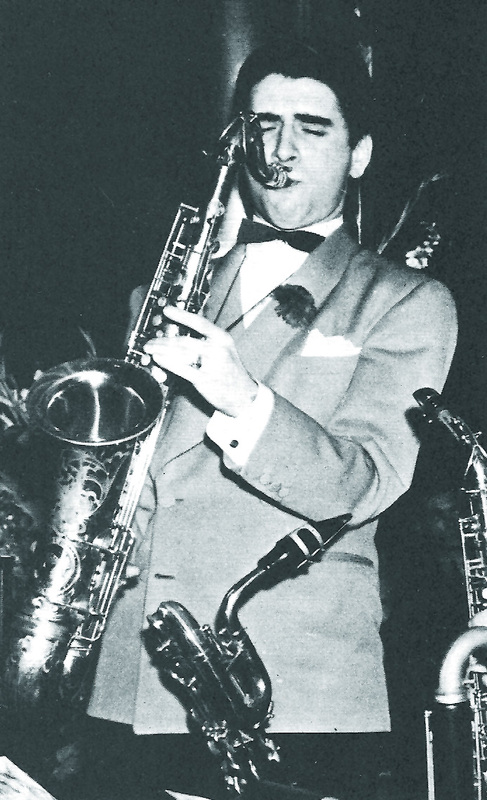 Something caught my eye – an old photo of what looked like a saxophone player. I casually leafed through the stack and realized the bits of newsprint were a collection of clippings about an orchestra leader and his band. And the photos were studio shots that showed the dashing maestro with his men. The clippings were old, clearly from the '30s or possibly the '40s. I realized that here on the ground before me was the find of my collecting career! I tried to maintain my cool while disinterestedly asking the woman how much she wanted for the pile. "Not for sale," was her abrupt reply. I was used to eccentric sellers at Maxwell Street, but this surprised me. "I just mean the newspaper scraps and these photos here," I said hopefully, pointing to the pile. She didn't even look at me. "Not for sale." I knew I needed to do something drastic. I found my friend and we pooled all the cash we had. Back at the woman's display, I held out a handful of bills. "Will you take $40 for the photos and the clippings?" The amount was wildly extravagant, an astronomical sum for a penurious grad student to pay for anything on Maxwell Street. 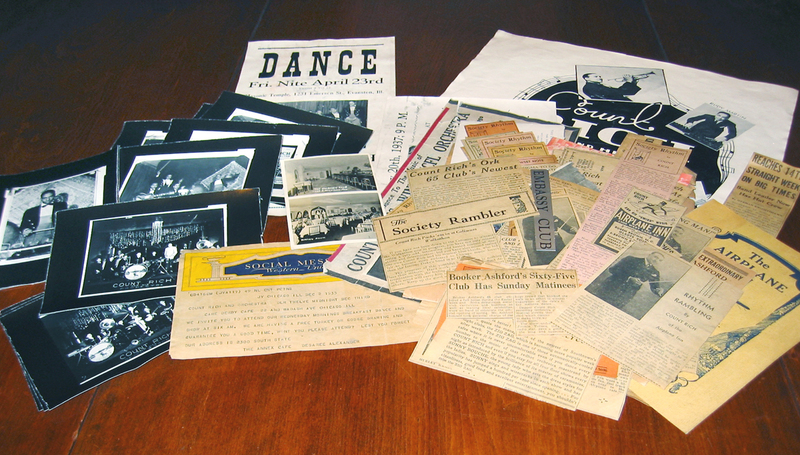 But I knew those pictures and clippings were historical artifacts, perhaps the only extant evidence of some long-forgotten Chicago jazz band leader and his players. They had to be preserved at any cost. The seller looked at me for the first time, and then looked hard at the money in my hand. Without saying a word, she snatched the cash and thrust it into the neckline of her sweatshirt. As she turned away, I quickly gathered up all the bits of paper and the photos and headed off down the street. "Now I got nothing left," I heard her saying after me. "That other fella took all the negatives. I ain't got nothing now." Later, I felt more than a twinge of guilt – a privileged white college kid taking advantage of an indigent black woman forced by circumstances to sell off her family's effects. That's how I imagined it, anyway, and a week later I returned to the market with professionally-made copies of the photos. After some looking, I found the woman and, with some satisfaction, presented her with the copies. "What's this?" she said, looking at the images with disdain. "I can't use this stuff – I want the negatives!" She tossed the images on her pile of wares and paid no more attention to me. I quietly left, figuring the encounter absolved me of any further concern over class exploitation. 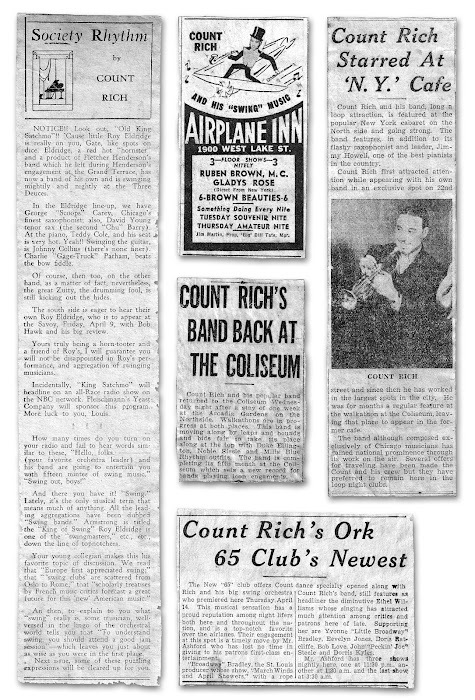 The illustrious career of Count Rich and his Orchestra, as traced over a decade through yellowing posters, clippings, telegrams, night club programs and studio photographs. When I got the collection of photos and paper bits home, I quickly realized that they once had been part of a scrapbook of memorabilia. Many of the pictures still had those little triangular photo corners attached them, and the backs of some of the paper clippings had traces of glue and the black backing paper of the page they'd once been affixed to. I only wish they'd been left intact in the book! But here was the legacy of a musician and band leader who called himself Count Rich. He'd led a society orchestra in the early thirties, playing for debutante balls and afternoon socials on Chicago's South Side. In 1933, he began writing a regular column for a music weekly called Club Chatter News, advising aspiring band leaders on the etiquette of music making and offering music business tips. He signed himself "R. Near Rich," almost certainly an optimistic pseudonym. The publication served the near South Side and the African American community, then confined to a section of Chicago known as Bronzeville. In the mid-'30s, Rich, ever the astute businessman, incorporated the increasingly popular swing jazz style into his band's sound. He hired "hot" soloists and, in 1934, scored a major gig performing for one of the first dance marathons held in Chicago. 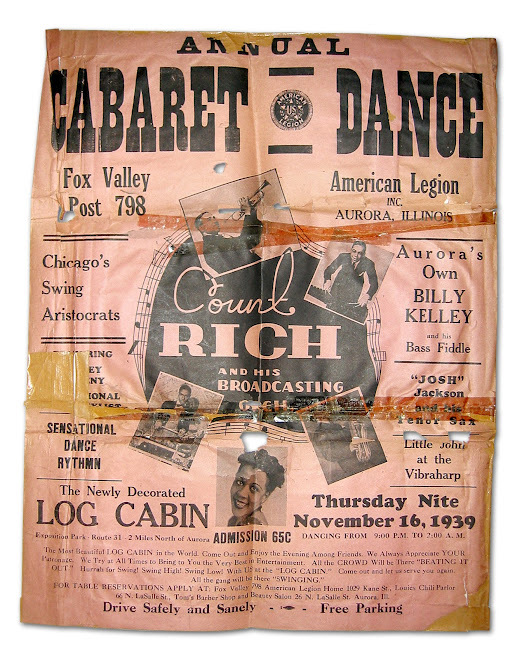 Produced by Leo Seltzer, who is best remembered today for inventing roller derby, the Depression era event featured dancers dragging themselves around the dance floor in an effort to outlast other couples and win a nominal cash prize. A marathon could last many weeks, and this one dragged on for fourteen. But Rich and his men grabbed headlines as the spectacle's hot jazz band – and an all-black outfit playing for an all-white event. They began broadcasting nightly at 11 over WCFL, and then over WBBM and WIND. 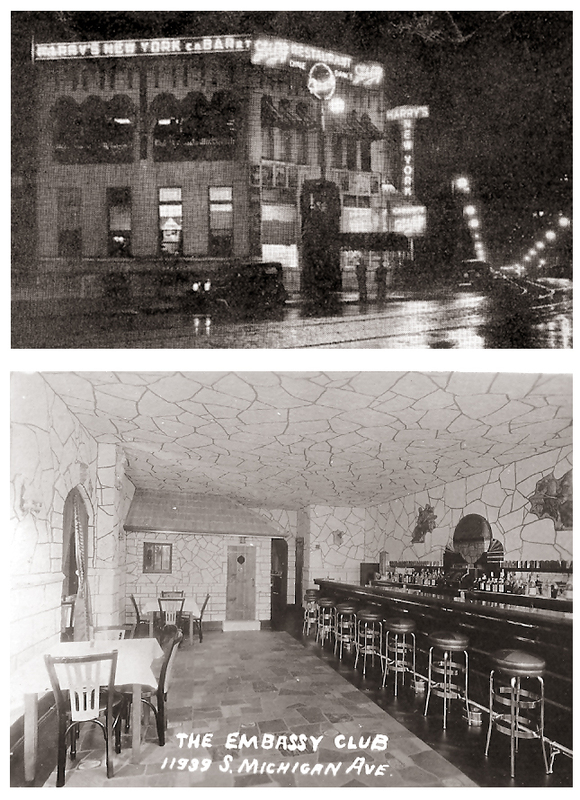 There followed an lengthy series of gigs around Chicago at now-forgotten venues like the Zig-Zag, the Rheingold, Club Ruspantini, the Derby Cafe, Harry's NY Cabaret, the Airplane Inn and the Embassy Club. The band also performed at the famed Dreamland Cafe, the Arcadia Ballroom and Chicago's Savoy. Rich's little group was compared favorably to Jimmy Noone's, and there was some talk of touring. But for some reason the Count decided to stay in Chicago, thus denying the band an opportunity to become better known and perhaps make a few records. Though billed on one flyer as the "recording orchestra," Rich's group apparently never went into the studio. Not only was Rich a leader, soloist and music columnist – he was also a composer. He wrote and arranged quite a number of tunes for the band, including "Hi-De-Harlem," "Black Moon," "London Fog," "Zig-Zag" (no doubt for the club of the same name) and "I've Never Found My Love." Featured soloists over the years included percussionist Eugene "Scotty" Scott, saxophonist Jesse Washington (supposedly from Bennie Moten's band), pianist Jimmy Howell and vibist Rudy Martin. One player who went on to national stature was guitarist Hurley Ramey. 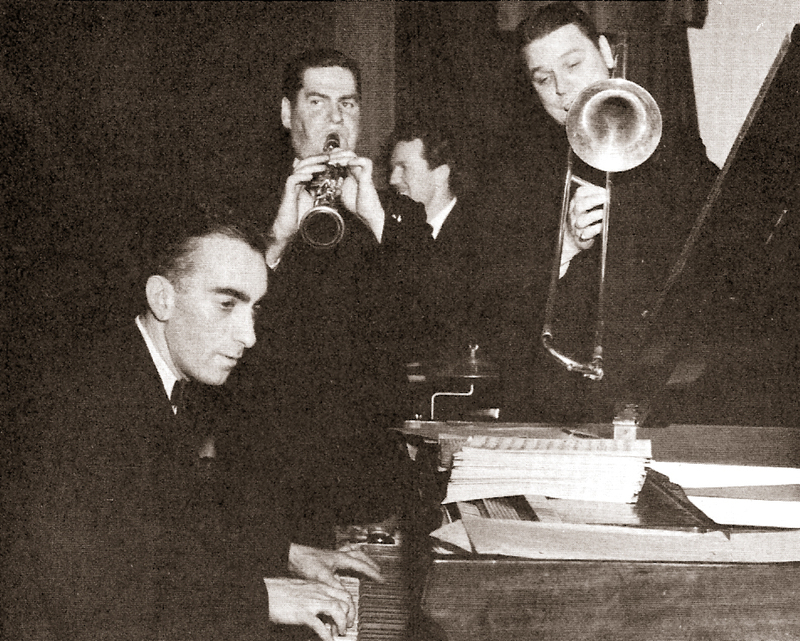 Starting out with Rich, he soon went with Horace Henderson's band and then on to Earl Hine's great orchestra. He was there when Charlie Parker, Dizzy Gillespie, Billy Eckstine and Sarah Vaughn were part of the group, and was recorded accompanying Bird on tenor in Bob Redcross's Chicago hotel room in 1940. So here, for posterity, is a sampling of some of the Count Rich material, stored lovingly in my attic lo' these 35 years. On the off chance you might have any additional information about R. Near Rich, please don't hesitate to send it my way! Count Rich and the boys on stage at the White City Ballroom, 63rd and South Ave. in Chicago. 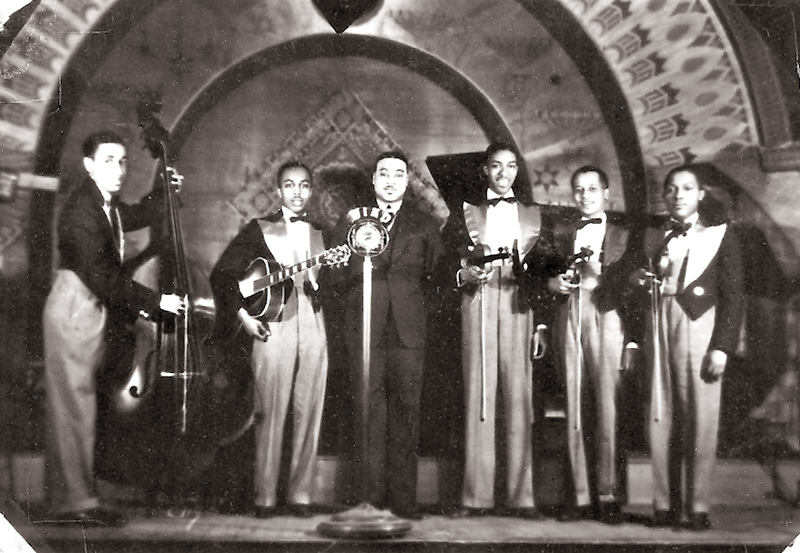 The year is probably 1934 and the players are, from left, Raymond Nelson, Hurley Ramey, Count Rich, Eugene Scott and two unknown violinists. In those days, all Chicago musicians had to play a string instrument regardless of what their main ax might be. Note the WIND microphone. This picture may well have been taken in WCFL's broadcasting studios, judging by the baby grand. That would be an unlikely instrument to find in a club setting. The microphone is a giveaway, too. 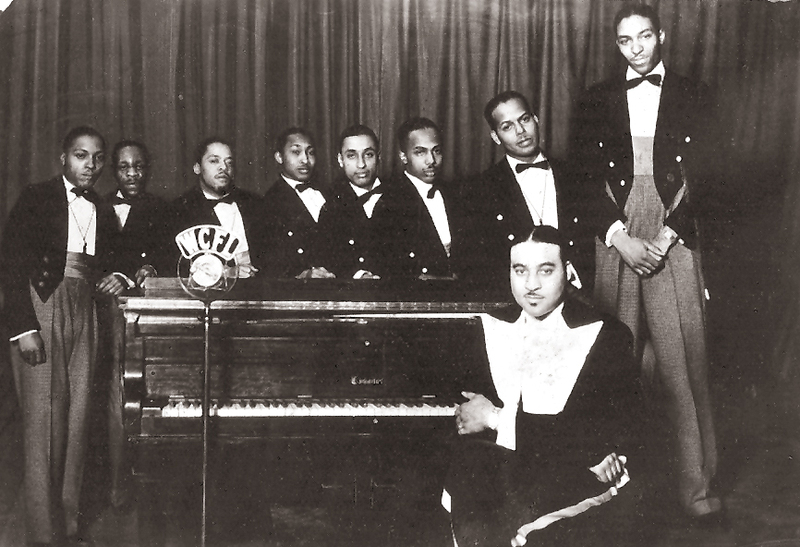 By November 1934, the Count Rich Orchestra was broadcasting regularly on WCFL's "band music program," and the photo may have been taken prior to one such show. Aside from Rich who is seated at the piano, we have Scott, saxophonist Faber Smith, Ramey and Nelson, from right to left. The other musicians are not known. A selection of Rich's clips, including one of his columns, left. 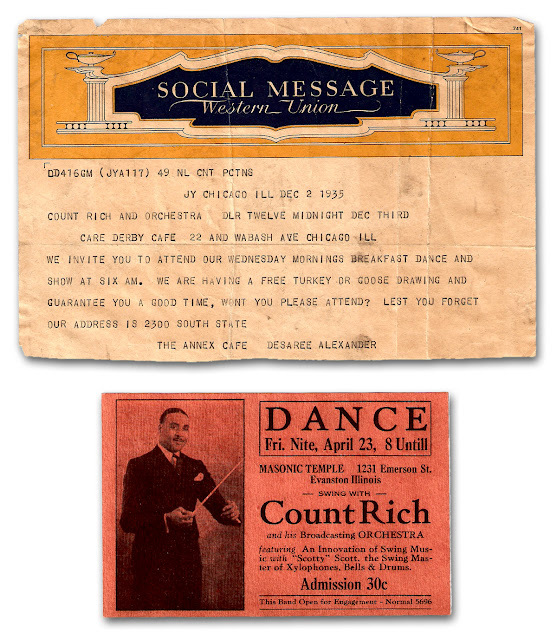 Clearly the Count was a Roy Eldridge fan – watch out "Old King Satchmo!" The Coliseum article ranks Rich's aggregation with the "Duke Ellington, Noble Sissle and Mills Blue Rhythm outfits" – odd company indeed! These articles come from the Chicago Defender and Club Chatter News. More clips. The marathon article, left, is at pains to point out how well-behaved Rich's "youngsters" are, clear evidence of racial pride in a "whites-only" situation. A portion of a poster for an unknown venue, touting Rich's radio connections and his recent appearance at the famed Savoy Ballroom. Probably from 1935. A telegram inviting the Count and the band to a breakfast dance at the Derby Cafe at 22nd and Wabash, presumably to perform. The 6 a.m. start time says a lot about how music back in those days was a 24-7 proposition. The Masonic Temple gig, below, touts Rich's star percussionist. This is the last bit of memorabilia from the Count Rich collection. 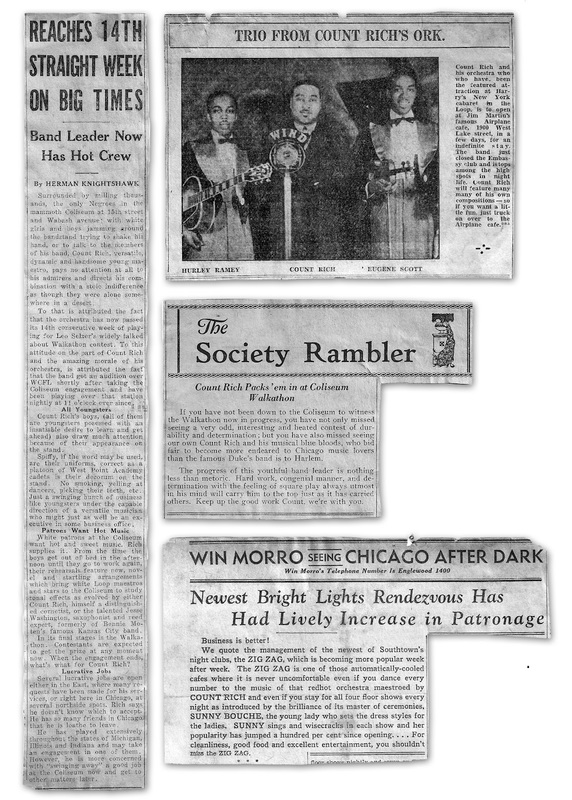 By 1939, the band was apparently playing fairly elaborate reviews in out-of-the-way places like Aurora, and though they were billing themselves as "Chicago's Swing Aristocrats," it must have been a hardscrabble existence. Next to the Rich material spread out on the Maxwell Street vendor's tablecloth were a series of period photos of a fleet of shiny new milk trucks. I can only think that Rich must have left the music business in the 1940s and started up a far more lucrative dairy delivery company. OK, OK – I know this is supposed to be a recorded music blog with downloadable rarities for all. I apologize for being so verbose and for slagging you with so many images. To make amends, here are a couple of musical selections that feature Count Rich's guitarist, Hurley Ramey. The first is the famous "Jelly, Jelly, Jelly," by the Earl Hines Orchstra. It was a big hit for singer Billy Eckstine and was recorded for Victor in December 1940. You can hear Ramey playing electric Hawaiian-style guitar behind Eckstine's vocal. The other soloists include Scoops Carry, Budd Johnson (on clarinet) and the Fatha himself. The other tune is of profound historical interest. It comes from the legendary Redcross recordings, made in a Chicago hotel room by Earl Hines' valet, Bob Redcross. Here we have Charlie Parker playing tenor – the instrument he played in Hines' band – with Ramsey accompanying. Hurley starts the piece off, sounding much the way he must have in Rich's group, and then Bird sets a tempo and plays several choruses of "Body and Soul." The date is February 1943, and this is one of the few very rare recorded instances of Parker during this period. There are a few musicians in the jazz idiom who have labored for decades playing music of depth, integrity and panache without ever achieving fame or fortune, or even much notice. One of those benighted few was pianist Art Hodes. I originally heard him on a series of reissues that Blue Note (by then owned by Liberty Records) put out in the early '70s. 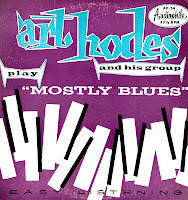 The label had originally recorded Hodes in a series of small group settings – Art Hodes' Back Room Boys, Art Hodes and His Blue Note Jazzmen, Art Hodes' Hot Seven, Art Hodes ' Chicagoans – and the reissues showed him to be an uncomplicated though swinging player, a guy who clearly had a profound understanding of the blues. This was when I was in New York. Shortly afterward, I moved to Chicago, Art's hometown. In Chicago, I developed a real appreciation of the blues – both the urban electric kind, and the kind played by Little Brother Montgomery, John Davis, Erwin Helfer ... and Art Hodes. I can't recall if I saw Art in person back then, but I believe I may have caught him as part of a larger ensemble in one of the early Chicago Jazz Festivals. He was still alive then and actively performing. While there, though, I did come across a couple of Hodes' LPs from the 1950s – in a recycling station on the city's South Side. There, amidst all the dumpsters of sorted colored glass, tin and aluminum cans, newspapers and magazines, were half a dozen boxes of long-playing records. Perhaps they'd been abandoned by some evicted jazz fan who'd fallen on hard times? I don't know, but there were some real treasures in those boxes, and the Hodes LPs were two of the best. The one included in this post is the better – and rarer – of the two. 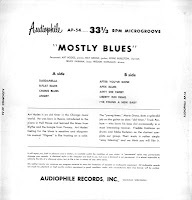 "Mostly Blues" captures Art Hodes and a small group playing familiar tunes and a number of blues, just as the title suggests. The band, Chicagoans all, features a then-young guitarist named Marty Grosz (listed on the label as "Milt"), one of the very few rhythm guitarists who solos using chords. I saw him play live with tenorist Eddie Johnson and drummer Barrett Deems, and he was quite amazing. As he did then, he plays acoustically here and is very impressive. Also in the band is Freddie Kohlman, a fine traditional drummer originally from New Orleans but living in Chicago at the time of this date. He'd worked with Albert Ammons and Earl Hines prior to hooking up with Art. The revelation, for me anyway, is bassist Truck Parham. Truck (born Charles Valdez Parham) was working as the doorman at the apartment building of a friend of mine when I was living in Chicago. I never met him, but I knew that he'd been an integral part of Windy City jazz history from the git-go, working with everybody from Roy Eldridge to Earl Hines to Art Tatum. He'd even studied with Walter Page. What strikes me about his playing here is how modern it sounds. Here's a gent who started playing bass right around the time bass players were switching from tubas to strings, and yet he sounds at moments like Oscar Pettiford or Ray Brown. He even bows his way through several choruses on a few of the tunes. One last thing. 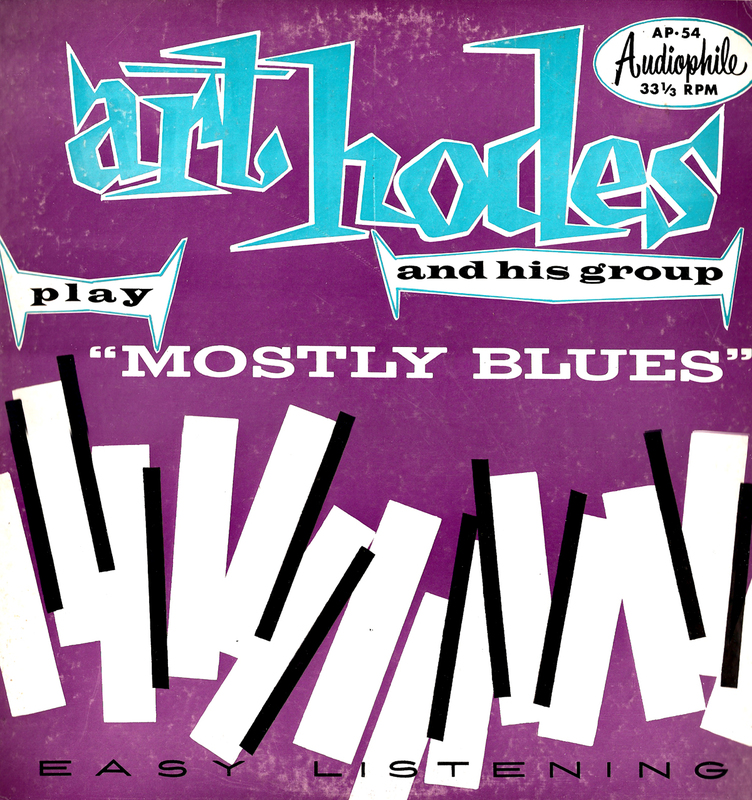 Art Hodes not only played wonderful piano, he also wrote as good as he played. His prose style was like his keyboard approach – simple, straight-forward, honest and insightful. 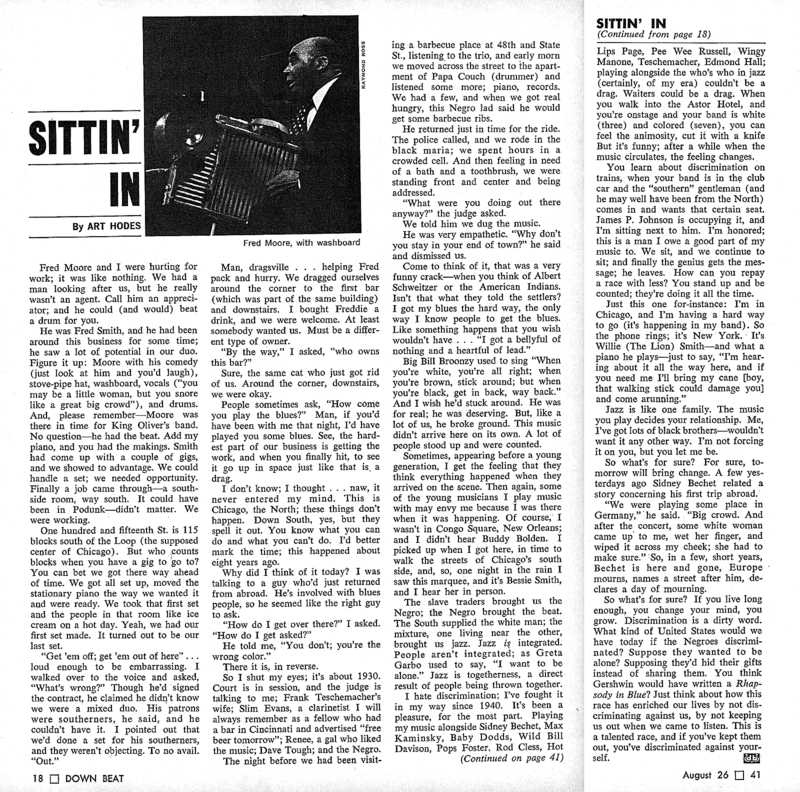 He wrote a column called "Sittin' In" for Down Beat magazine for about a decade, and here's the one from the August 26, 1965 edition. It's Art's take on racism in music, a topic that still resonates today. As always, these files were ripped from the original vinyl with only a gentle cleaning of pops and clicks. Be forewarned, there is some slight surface noise. Art Hodes, p; Marty Grosz, g; Eddie Burleton, cl; Truck Parham, b; Freddie Kohlman, d.
Here's a brief addendum to the Joe Marsala/Adele Girard post of a few weeks ago. A local church sale yielded up this gem, complete with a lovingly hand-lettered sleeve. No doubt the previous owner was one of us – a collector of fine recorded sound, I mean. 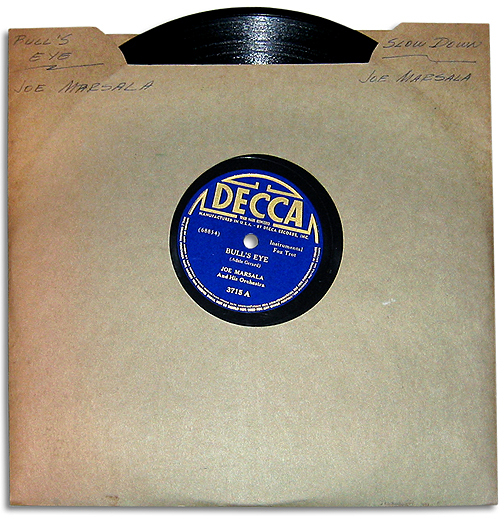 It's a Joe Marsala date for Decca from March 21, 1941, done in New York City shortly before the country's entry into World War II. Most of the players would soon be gone in the draft, and within a year nearly all studio activity would cease under the Petrillo recording ban. 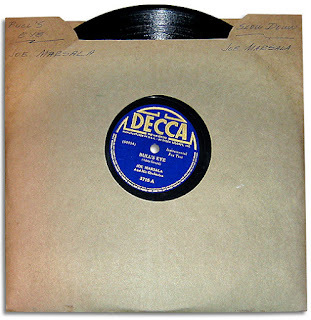 But in early 1941, things were humming along, and Marsala did a number of solid sessions for Decca. The title of this piece is "Bull's Eye," and I post it here because it's an Adele Girard original. It seems to draw from the classical repertoire, and even quotes a very familiar theme (so familiar, I can't think of where it comes from at the moment). Adele solos nicely, as do Joe and his brother Marty, as well as mysterious tenor man John Smith (unknown to me, and with a name like his, completely unsearchable on the interwebs). Also of interest is 20-year-old drummer Shelly Manne, who gets in some very nice fills (and starts off the piece). For the record, here's the personnel: Marsala, clarinet; Marty Marsala, trumpet; Ben Glassman, alto, clarinet; Smith, tenor; Dave Bowman, piano; Girard, harp; Carmen Mastren, guitar; Jack Kelleher, bass; and Manne, drums. It's scratchy, but heck, what'd you expect from a 70-year-old bit of phonography?